On Saturday, Suna West MP Peter Masara sent political shock waves when he turned up to receive Deputy President William Ruto. 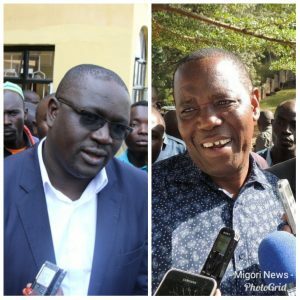 Masara, the only Independent candidate in Luo Nyanza, joined the ODM bandwagon to nosily skipped Ruto’s Monday tour of the county. On Monday, Ruto launched a street lighting project at Masara center in his constituency where Masara claimed he skipped since he was not invited by handlers of the meeting. The legislator’s handlers and online blogger made noise about NG-CDF funding the project which was being stolen by Migori governor Okoth Obado. When he picked the microphone to speak, bewildered leaders looked on in anticipation on what he wanted to say before he pledged to work with Ruto. “I am told you sent a message that I should look for you. I have come here to look for you and I am willing to work hand in hand with you regardless of our political affiliation,” said Masara. The message Ruto had sent was that Masara was to look for him for building a Technical Training Institute similar to the one launched at Kendege in Kuria East for Sh300million. But Migori News can authoritatively reveal that Masara decision followed a well calculated moved by former MP Joseph Ndiege, who placed him in a fix. “We don’t want to have Masara play with development and politics, I am ready to assemble elders from Suna West to go and bring the institute if he doesn’t want to,” Ndiege vowed in a local radio station call in. Ndiege made the threats known that the institute will directly benefit residents and questioned why their legislator was not there to pick it, this created a bar stool talk in the constituency. In a strong coded message, Ndiege heavily hinted that Masara who hails from Gwassi clan in Homa Bay did not have majority Suna clan interest at heart. Earlier during the Migori senator by-elections, Masara came out strongly to campaign for ODM candidate Ochillo Ayacko making him gain much ground in Orange House against Ndiege. But with turning up at Ruto’s camp today, this is set to be eroded. “We have nothing to lose in team Ndiege, if Masara had refused to turn up we could have scored. He turned up today we have even scored more. We will use the visit to build a political mileage in Suna West,” Ndiege’s close confidant said.